As a matter of fact, despite some inkling of the trouble that seemed to be occurring way back in the day, it wasn’t until I understood from watching this movie a little bit of what was going on back in the day! Another thing that I found that I really liked about this movie is the cast in this movie… For me, seeing this movie for the first time, I actually hadn’t really gotten to know who most of these people were, and since then have been fans of everyone from this movie, (the only one that I happened to know about was James Earl Jones (Star Wars), and that was because I had seen both Star Wars (1977) and Field Of Dreams (1989) before I had ever heard of this movie. The last thing that I thought that I would mention is that this movie is actually based on the Tom Clancy novel of the same name… And like the majority of titles in film that are based on novels, if you haven’t yet read the novel, but want to do both, then I highly recommend watching the movie first and the reading the novel… Because the truth is, is that where as the movie is good, the book is great! Written by: Larry Ferguson (Highlander), Donald Stewart (Missing), and Directed by: John McTiernan (Predator). 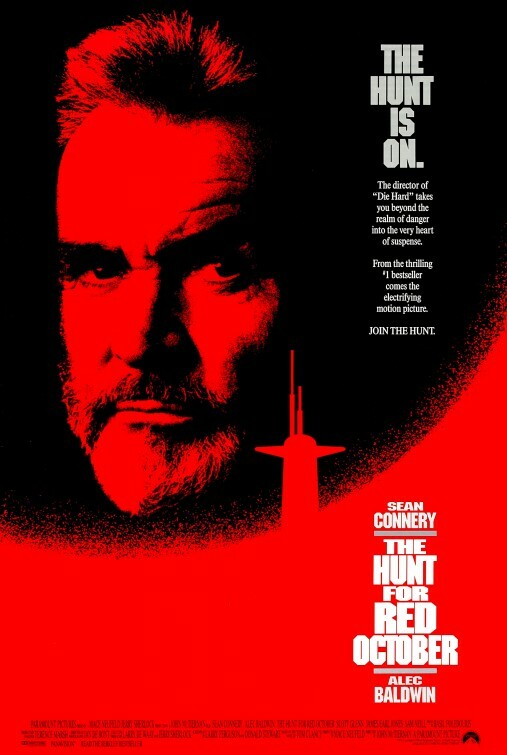 Starring: Sean Connery (Dr. No), Alec Baldwin (Mercury Rising), Sam Neill (The Tudors), Tim Curry (Clue), Courtney B. Vance (Dangerous Minds), Stellan Skarsgård (The Glass House), Jeffery Jones (Stay Tuned), and Fred Dalton Thompson (Die Hard 2). Now it will be up to Ryan and the crew of this lone American sub, to find Ramius and get him safely to the United States, while faking Ramius and his crews death, so that he can avert World War 3! Captain Ramius as he meets with Jack Ryan (Baldwin), and Captain Bart Mancuso (Glenn), as they make preparations to start the defections! The last thing that I thought that I would mention here, is that Jan De Bont (Speed) did the cinematography for the movie! All in all, if you haven’t seen this movie yet, then you might want to check this one… It is a fun one!